I’m still learning the ins and outs of the machine, so there will be plenty more to come about making pizza crusts, rolls, even jam perhaps. But for now, I thought a warm loaf of bread would be a way to end this week with a bang, and begin a weekend of family fun, food, and celebration. **instead of using xanthan or guar gum, you can also substitute 1 tablespoon of ground flax meal, combined with 2 tablespoons of boiling water, add this to the wet ingredients. 1. In a large bowl combine all of the dry ingredients, except the yeast — whisk together the flours, salt, and guar gum (or flax) and set the yeast to the side. 4. Carefully add the dry ingredients on top of the wet ingredients in the machine — you can easily do this by using a ¼ cup measuring scoop and gently scooping the dry ingredients in, creating a layer on top of the wet ingredients. Then, top the layer with the yeast. 7. When the baking cycle is complete, REMOVE THE BREAD! Although there is a warming period at the end to keep things nice and toasty, I feel that this steams the bread too much, so I remove it right away and get it onto a cooling rack. 8. If you are like me and want a nice crusty top to the bread, you’ll need to follow this additional step, the breadmaker won’t give you a browned top like baking it in the oven would. But it’s EASY to do — just rub a little butter on top, (it will be simple to melt since the bread is still hot) wrap the sides (but leave the top open) with foil, and put under the broiler for a few minutes. CLICK HERE to see my demo of this step. 9. Let the bread cool completely (if you can!) before cutting and serving. Enjoy every bite. Some people are not fans of leaving the mixing blade in while the loaf bakes, feel free to remove it after the stirring cycle has completed. (be careful, the machine gets hot) I just leave the blade in and remove it after it has cooled — gluten-free breads can be sensitive and I don’t like to mess with them. Plus, there will still be a small hole in the bottom of the loaf where the blade attaches in the pan, so I don’t feel it’s worth the work. Totally up to you. You don’t have to bake the loaf in the breadmaker! You can remove it just before the bake cycle and shape it into your loaf pan of choice. 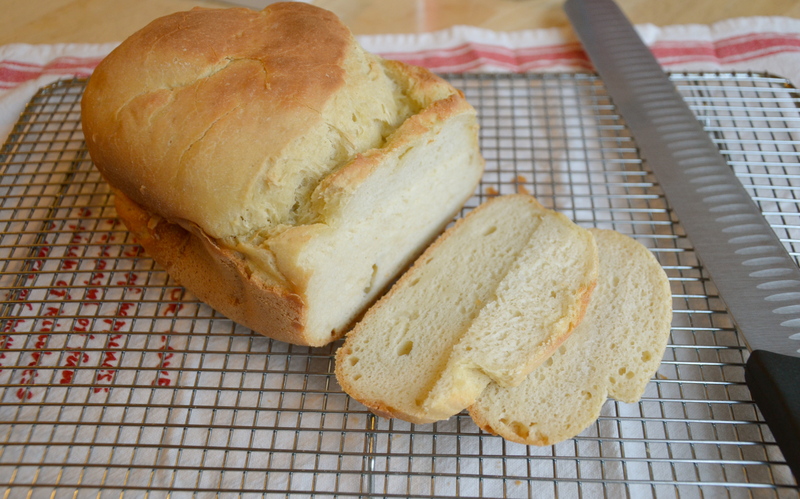 My husband has his eye on a sriracha loaf, so we’ll be experimenting with that soon. My goal this week was to just get a feel for the breadmaker, the basics, and then we’ll go from there and who knows where we might end up! Please comment below if you have other tips to share with us. And if you make the bread, come back and tell me how it went! Remember that not all gluten-free flours behave the same. You want a wet dough, but not runny. If your dough batter is too runny, just add some more flour in, even after the cycle has started to mix. For the multigrain loaf, I knew it didn’t look right, so I ended up adding a bit more flour to the mix. 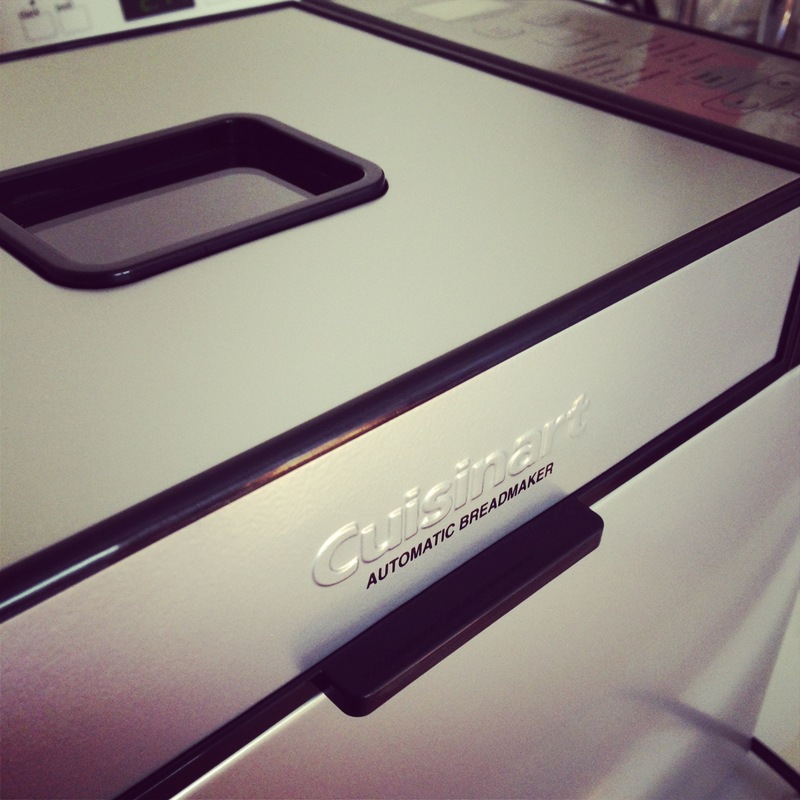 If your breadmaker doesn’t have a gluten-free setting — that’s okay! There are a few options: you can check your owner’s manual – some machines will allow you to override the settings and reset them yourself to include a mix, rise, bake cycle. (no second rise is necessary) You can also use a “rapid” setting that some machines have. The bread is done when it has reached 190 degrees internally. If you take it out and it isn’t quite done, you can always put it into a 350 degree oven, no pan needed, to finish it off. There are endless possibilities for add-ins to this bread — garlic or chives, olives or cheese, play with the recipe and make it your own. If you’re a jam girl like me, slather it on. Or just eat it plain. Still a little warm. Fresh or toasted, you’re in for a treat! I’ll be back with a “week in review” photos post later this weekend — I wouldn’t want you to miss out on the Easter photos — word has it, my mother-in-law is making lemon bars (yes!!!!!) gluten-free style, a new recipe using almond flour. 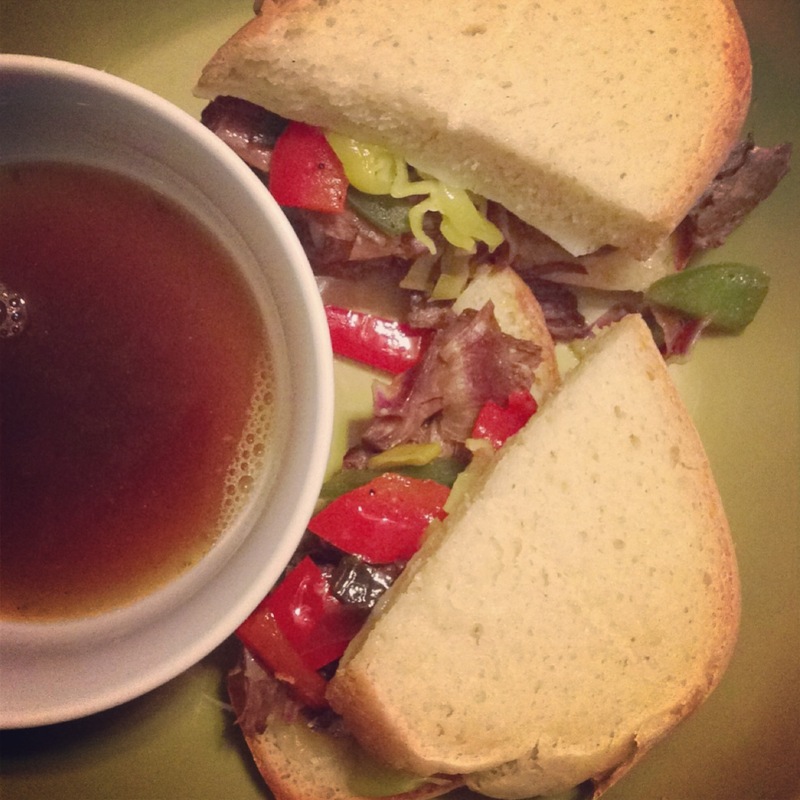 Posted on March 29, 2013 by Sarah @ Celiac in the City •	This entry was posted in Recipes: let's eat! and tagged cheap gluten free bread, Cuisinart breadmaker, Cup4Cup gluten free flour, easy gluten free bread recipe, gluten free bread, gluten free bread machine recipe, gluten free bread maker recipe, homemade gluten free bread, King Arthur's Gluten Free Flour, tips for your breadmaker. Bookmark the permalink. I want to use your recipe to make my first loaf of bread. I do have a breadmaker. It’s an older model. It does not have a gluten-free setting. Any suggestions? It has settings for white bread wheat bread quick bake dark and light crust. What are the exact measurements for the flour blend please. Kima — I just take the total (3 1/4 cup) and then used some from each of the bags I had in the cupboard to fill that total, that was years ago now. I mostly use Cup4Cup flour now. Just whipped this up and dumped in bread maker. The directions were super simple especially considering I’m new to bread making/bread maker! What I love most—the recipe doesn’t require a million different types of obscure hard to source flour. 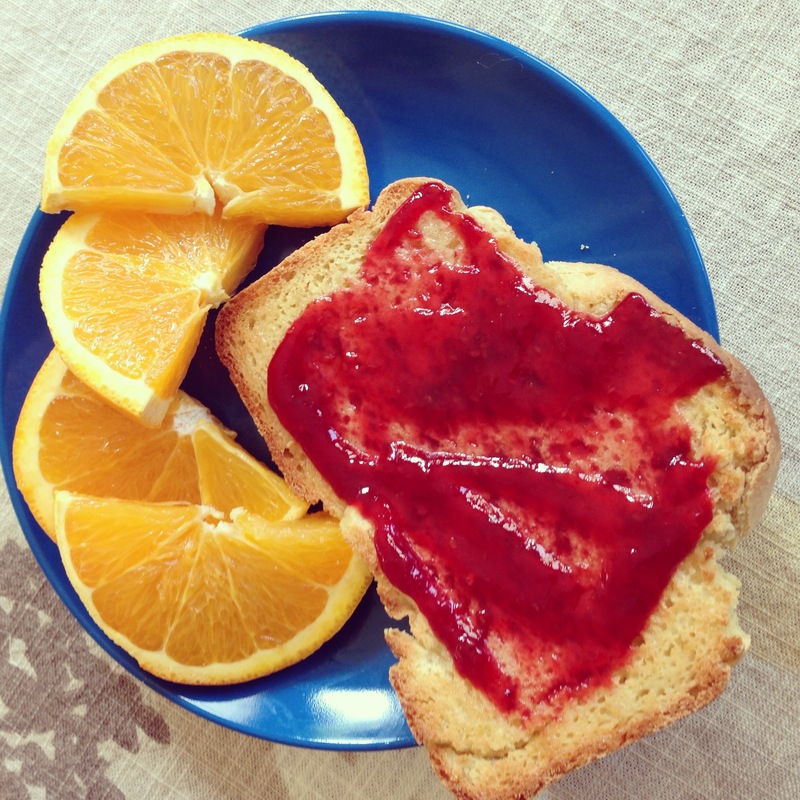 This is the best recipe and the most success I’ve had with gluten free bread! Aside from the pre-made mixes, I have not been able to find a loaf that is not hard as a rock or like dough until now. Thank you for sharing!! Also, I used the flaxseed method. Well, my friend, you made my day! (my week!!!) I just finished my 50 days of real food challenge and think it’s time to get the bread maker out again for some fresh bread — so happy you are enjoying it, it is a favorite around here too! I’m desperately looking for a quinoa bread recipe that would be egg whites-dairy-gluten-potato-rice-oats-corn-soya-almond free. My child is intolerant to all that. My few options are quinoa, buckwheat, camel milk, coconut milk and egg yolks. Any ideas? My daughter and I would be really grateful. Thanks for stopping by — it gets difficult to find options when there is more than just gluten to consider. I would try searching for “allergy free” or “allergy friendly” options and then try to modify to best suit her needs. Good luck! That is a really good bread maker you have for gluten free bread, you know. Although there are other bread machines with the gluten free setting, I felt that this one makes the best gluten free bread ever. Could I use bread machine yeast? Also, could I use sugar instead of honey? Yes, sugar would be fine. Hi, Julie — although I did not use that specific kind of yeast, it would probably work. Do you think I can make it using Gluten Free Cafe All Purpose Baking Mix? It is a box mix of rice flour, sorghum flour, tapioca starch flour, has leavening, and xanthan gum. You could most definitely try it out — I’m not familiar with that particular mix, but have used several different options successfully, good luck! Hi Sarah! Thanks for posting this great recipes. I just have a quick question. I have the same bread maker you have, and I was wondering what settings did you use for the loaf size? 1, 1.5 or 2 lbs? Many thanks! Hi Kristen — check out the other responses on this post for some ideas and tips! I just made this. Fantastic! Thanks. Bonjour Sarah! 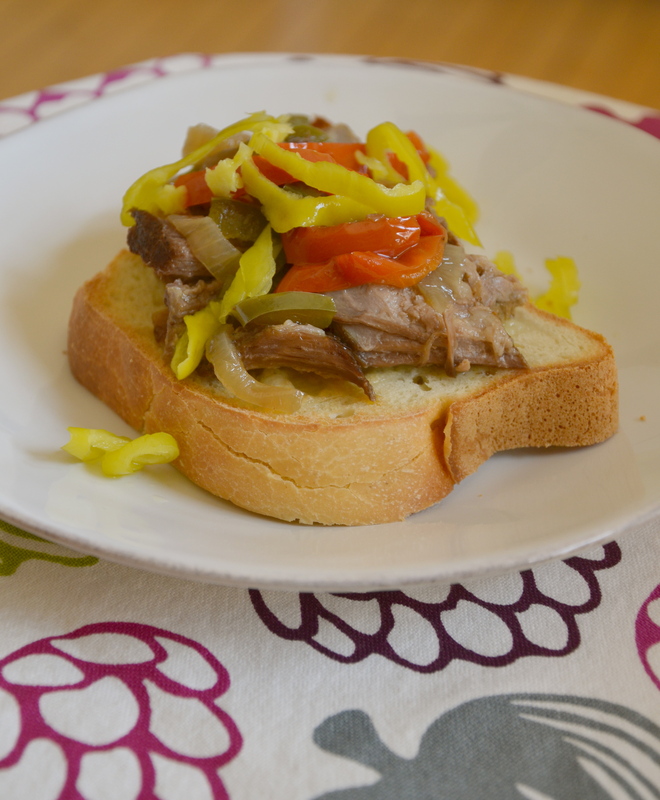 Thank you so very much for the recipe! I have just recently run into troubles with my old recipe for the breadmaker – dry and crumbly. So I made a loaf using your recipe last night. Oh boy, I’m eating the crusts for morning tea. Divine. But, the problem is that the loaf sunk in the middle. The crusts were high and it obviously just collapsed mid-cooking. – Rapid Bake (one cycle of rising). What would you suggest my problem is? Add more flour? (The batter was like a thick cake batter.) Add less liquids? Any ideas? Bonjour! Do you have the same bread maker as the one pictured? Hmm… it could be too much liquid, yours sounds a bit more runny than mine, I need to make it again with a video and/or more photos for folks to see exactly what each step looks like. Which flour blend did you use? It can vary with GF flours, so you sometimes have to tweak it. For instance, I standby and watch to be sure it looks right and add flour or liquid to get it just right if I use a new flour blend. No, I don’t have that brand. I just have a local Chinese brand. I’m working in China at the moment, and the only flour I can really find is white rice flour, sweet white rice flour, corn flour (ground and not starch), and tapioca starch. I tried a combination of the 2 rice flours and tapioca starch. I’m going to experiment again tonight and will add a little less water, and watch to see if I need to add more flour. Thank you so much! Do you have access to any other GF flours? At this point, you’re dealing with all starchy flours, (this may be your only option, in which case we’ll find another way to to!) and that could be causing some issues as well, any chance you can get your hands on another grain flour? Ah! All starch flours – that must it. I made it last night – using much less liquid. Great consistency! Tastes great. Just didn’t rise too much. So I might pop over to a local import store and see what they have. Thanks bunches! Try a 40/60 ratio: 40% whole grain and 60% white flours/starches, that’s the case for any GF baking and hoping that will do it for you — but do keep me posted, want this to work for you! I have to substitute the eggs with flaxseed meal because my kids can’t have eggs. My dough ends up being crumbly and dry. Instead of guar gum i used xanthan and the flour i’m using is the Robin Hood Gluten free flour mix. Please help! Thanks! Hi Sylvia — I’m no help with the egg substitute end of things, wish I could help but I know many struggle with breads that have to substitute out for eggs. Sounds like you may need more liquid though — did you add liquid with the flaxseed meal? I’m not familiar with that mix — but by doing a few searches, it seems others haven’t had the best of luck with it at times as well. Maybe try a different flour mix? I used the same flour (robin hood gluten free all purpose), not sure if there is a difference in Canada like with regular all purpose flour (Canadian all purpose wheat flour can be used for bread where American can not). I followed the recipe to the letter other than using regular salt and my results were not what I would call bread. The outside was dry and crumbly and the inside was wet, dense and chewy. Robin hood does have a bread recipe for this flour but I’m not sure how to adapt it to the bread maker I am using (black and decker b1650). I’m not familiar with Red Robin’s blend, that may be the issue — but happy to help you with the bread maker. I don’t have a bread machine, but would love to make this bread! Could I still follow your directions and bake it in the oven? Seems like I would need to do things a little differently when adding the dry ingredients & yeast. You could definitely make this in the oven — you can mix all of the dry ingredients (including the yeast) together and then slowly add those to the wet ingredients, then allow time to rise before baking. How would l go about baking the bread dough in a regular oven. My bread machine has not option to bypass the punch down before the baking. What temperature should I bake my bread in the oven? Hi Natalie — what bread maker to you have? It definitely be made in the oven, you could bake it at 375 degrees, time will depend on your loaf, but the internal temp should be 180 degrees. Do you think this would work with other whole grain flours? I’m interested in finding recipes that use flours with a little better nutritional “punch” than rice flours, but I’m not a seasoned enough GF baker to know what would work off the top of my head. Any ideas or suggestions would be greatly appreciated! I did use King Arthur’s GF whole grain mix for part of the flour on one of my attempts — I’m just going to be honest, it wasn’t nearly as good. I’m with you though and I’m still playing around with it. I have tried using all whole grain flours in doughs/batters in the past with little luck — for me personally, I have had better success with starches being included as well. One thing about the King Arthur’s mix is that it has quinoa flour in it and I’ve come to realize it is NOT for me, cannot stand the flavor, so I do want to try other whole grain options. If you do end up experimenting, please let me know how it goes! It looks might tasty, Sarah!